All transactions are safe and secure with a reliable history in online purchasing behind each of our associates. Buy the Official 24 CTU Mug to own 24 clothing and merchandise. 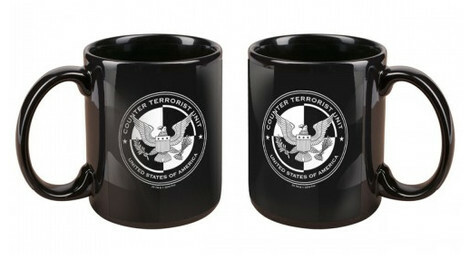 Pair this 24 CTU Mug with any of our bestselling CTU t-shirts, including the Bauer Counter Terrorism Unit tee or hoodie. The front of the 24 CTU coffee cup features the Counter Terrorism Unit logo seen on the TV show. Convey your allegiance to CTU agent Jack Bauer and everything that the CTU seal stands for. Always remember all of the surprises he gave us. In addition to the Official 24 CTU Mug above, browse the 24 Clothing Gallery for more apparel like men's and women's clothes, kids shirts or hoodies.